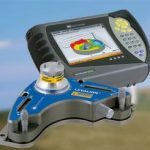 INCLINEO is a powerful system utilizing high precision electronic inclinometer technology with a resolution of 0.0003 DEGREES. 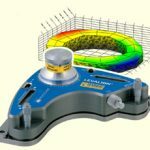 In combination with interchangeable mounting bases INCLINEO measures relative or absolute angularity, flatness, levelness, or parallelism of surfaces; as well as perpendicularity of planes, and straightness along a line. Its rotatable housing allows the INCLINEO to take measurements at any angular position, including surfaces with a steep inclination. The 3-key operation makes INCLINEO versatile, ensuring flexibility during measurements and creating effective operation in advanced applications. 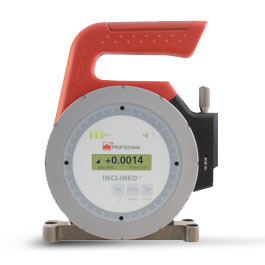 Surface flatness measurements using INCLINEO are simple. A reference grid is laid out on the surface to be measured and the INCLINEO is moved between each marked location, measuring the angle over a known distance. The system features integrated wireless communication technology which sends the measurements to A COMPUTER running the ALIGNMENT CENTER SOFTWARE. 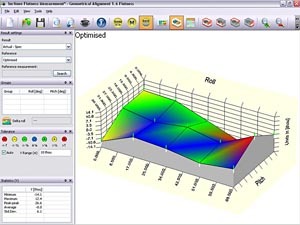 The surface profile of the measured component is shown in full color 2-D and 3-D graphic display with color coded tolerance levels giving a clear representation of the results.